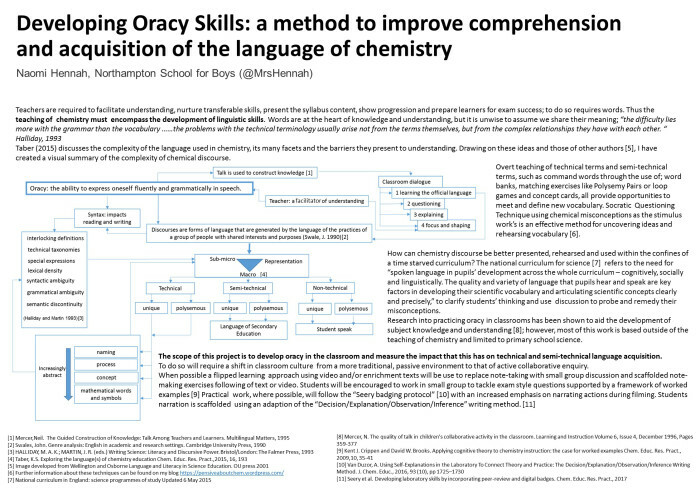 Mrs Naomi Hennah (@MrsHennah) of Northampton School for Boys has created a clear and concise “visual summary of the complexity of chemical discourse” to boost oracy skills and language acquisition in chemistry. (Link at the end of the page). Teachers from other subjects should not be put off, however. This post should hopefully make Mrs Hennah’s considerations relevant not only to other fields of science (which would not require a huge leap of the imagination) but to all subjects, as remote from Science as, say, Religious Studies. Talk for Writing is a comprehensive and creative literacy program created by Pie Corbett and supported by Julia Strong. It encourages children to imitate topic specific language orally before reading and then writing the now familiar words. T4W is a phenomenon that has revolutionised literacy education predominantly in Primary Schools. Indeed it was an inspirational Reception Teacher, Mrs Louise Hunt of Geddington C of E Primary School, who first drew my attention to the technique by demonstrating the incredible impact it had on learning. Her class bloomed, overnight it seemed, into independent story tellers. Through Mrs Hunt’s enthusiasm and guidance, Pie Corbett’s technique been used successfully throughout the school with different aged children and for different genres of writing including scientific report writing. Even without delving into primary research every teacher can see that literacy is pivotal to learning, it is after all how ideas are met, reported and assessed. It is the case in Chemistry, Science and indeed all subjects, that words matter and furthermore how they are strung together into sentences and paragraphs matters. Pie Corbett talks about developing linguistic competency with a method that not only forces the information to be processed but requires an understanding and ownership of its meaning. The traditional read then write process has metamorphosed into read, hear, speak then write so that a learner is provided with ample time to recognise words and the pattern and flow of language that give rise to fluency and meaning. The Hook; the starting point or context to introduce vocabulary and language patterns verbally. The imitation stage; the teacher provides a model text from which the student verbalises the vocabulary met in the context. This is the time to probe understanding and draw forth ideas, to identify and modify misconception. The innovation stage; small group work to “box up” the model text into stages and then make modifications to create a personalised version. Storyboarding and other visual techniques offer the opportunity for dual coding. Innovation demands an understanding of meaning if the text is to be successfully modified so the sense remains unchanged. The Invention stage; here the students take what they have learned, the vocabulary and language patter and, apply them to a new context to create an independent text or even solve a problem. When learning science practical work should provide a mechanism for linking the abstract domain of ideas to the concrete domain of observables. Practical work should drive and enrich understanding of the subject and report writing should showcase this progress. In practice this is not always the case as, technical skills, vocabulary, analysis, calculation and evaluation all vie for attention creating confusion rather than clarity. The T4W methodology offers an opportunity to develop mastery of both generic report writing but also conceptual understanding. Whilst working through the T4W process, a scientific concept will be repeatedly revisited until the learner has the ability to apply it in a new context. In this respect T4W is helping students’ progress through Bloom’s taxonomy of higher order thinking skills as well as supporting their literacy development. The hook, is introducing and perhaps demonstrating a practical activity, an exemplar method is provided that includes how to process the data generated by the experiment. Imitation, if the technique has been demonstrated this is where the students carry out the practical will be encouraged to talk through what they did and what this tells them. Listening to and developing their choice of vocabulary here is important so that terms like volume and amount are not used interchangeably. A visual practical map could be used as scaffolding to support students; perhaps target key terms rather than key events. Innovation, here the student will be focused on boxing up the text, this can include the sequence of steps required for a calculation. Once the exemplar has been boxed up the text can be modified. A simple modification would be to alter any numerical values and follow these values through the calculation steps. Invention, the student will take the ideas explored and employ them to carry out a new task such as write a method, analyse data or complete a similar calculation. Imitation: The students are asked to carry out the experiment, before doing so the students are asked to read through the method and in small groups’ story board the task and highlight the key pieces of data that they need to collect. Also identify and mark any hazards such as hot equipment and an open flame. Ask the students to practice any tricky techniques such as moving the crucible or lifting the lid using tongs. By the end of this task there should be a rough story board, the mass of crucible+ lid, the mass of crucible+ lid+ magnesium before heating and then the mass of crucible+ lid+ magnesium after heating. Innovation: the exemplar text will provide collecting the data as demonstrated by the experiment and how to process the data to find the mass of magnesium. To achieve this we will box up the exemplar text, include any linking information from the text and innovate with the numbers generated during the experiment. Invention: the last part of this activity was to see if the students could now follow this technique to answer the following question: 2.4g of carbon reacted with 0.8g Hydrogen to form a compound. What is the formula of the compound? The class repeatedly applied the boxing up to a number of questions and by the end of the lesson everyone could use this method to calculate the empirical formula of a compound. It should be noted that a number students did not want to continue to box up the method as they felt it was no longer necessary. 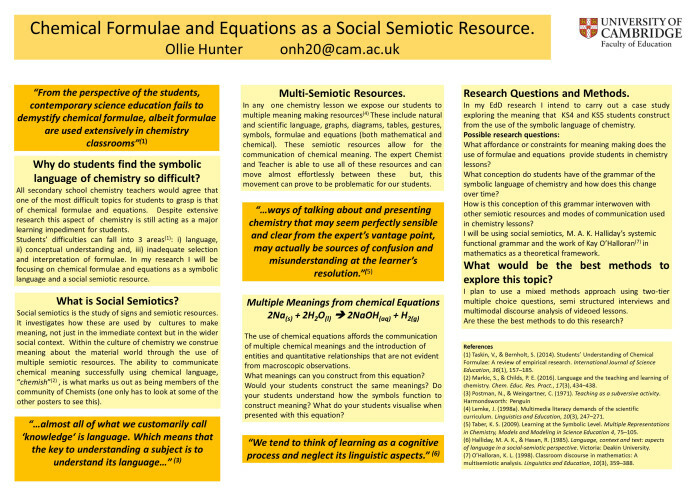 I have created a couple of laminated exemplar templates to box up questions as we meet those (examples below). I will target calculations and longer answer questions for both GCSE and A level classes to encourage a systematic approach to tackling a question. I would very much like to hear from other teachers using talk for writing in science lessons of any key stage. I feel that this is an important tool particularly in view of the curriculum changes which have a greater emphasis on long answer questions and maths skills. Are multiple choice questions an effective tool for determining language comprehension? How can the link between oracy development and language comprehension be effectively determined? You can discuss any or all of these points in the discussion below. Naomi is on Twitter also. Remember to tag any conversations with #MICER17. Do my bottlenecks qualify as threshold concepts? Why/ why not? Can you identify any threshold concepts that are fundamental to understanding key areas of the KS4 curriculum? How can we ensure that students develop a true understanding of key concepts and don’t resort to “mimicry”? You can discuss any or all of these points in the discussion below. Niki is on Twitter also. Remember to tag any conversations with #MICER17. 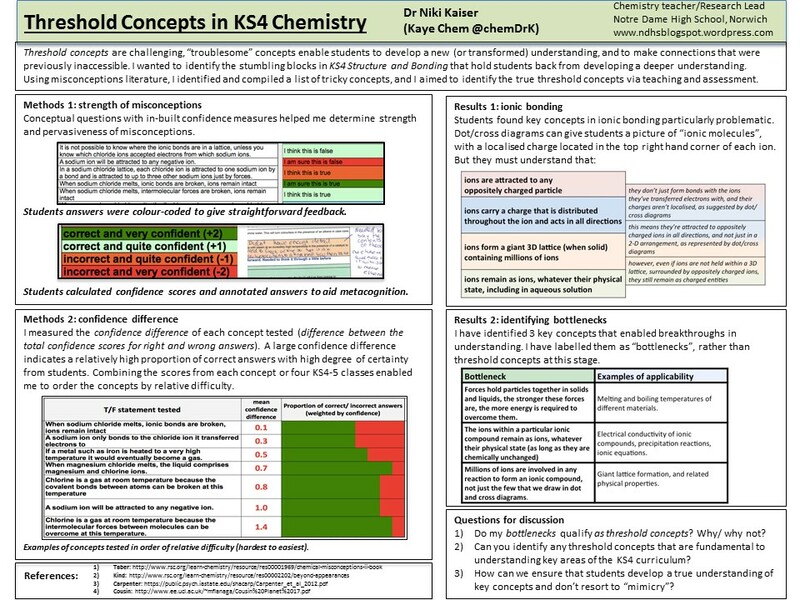 I describe here how I’ve identified troublesome concepts in KS4 Chemistry, and determined their relative difficulty and pervasiveness. I have blogged about this work over the past year, from planning and identifying concepts through teaching and assessment to suggestions for teaching the topic based on what I found (latest post http://bit.ly/Bottlenecks). I summarise some key aspects here. You can discuss in the comments below. What experience is there of using social semiotics and systemic functional grammar? I plan to use a mixed methods approach using two-tier multiple choice questions, semi structured interviews and multimodal discourse analysis of videoed lessons. Are these the best methods to do this research? Great reflection of my thoughts and more. This is a great place to start considering ways in which oracy could develop and improve your teaching practice. Courtesy of the Reading Sage, who is a wonderful resource for a wide range of links related to language and literacy. Some simple strategies that can be tried out to develop oracy skills: … number of oracybased teaching ideas – developing dialogue toolkit.